Why Utilize Best Maintenance Repair Practices? What is True Preventive Maintenance? Ricky has over 30 years in maintenance and reliability as a maintenance manager, maintenance supervisor, maintenance training specialist, field engineer, maintenance mechanic, maintenance consultant and is a well known published author. Ricky has worked with maintenance organizations in hundreds of facilities, industrial plants, ships, etc, world wide in developing reliability, maintenance and technical training strategies. Prior to joining Allied Reliability in 2008, Ricky worked as a professional maintenance employee for Exxon Company USA, Alumax (this plant was rated the best in the world for over 18 years), Kendall Company, and Hercules Chemical providing the foundation for his reliability and maintenance experience. Ricky is the co-author of “Rules of Thumb for Maintenance and Reliability Engineers”, “Lean Maintenance” and “Industrial Repair, Best Maintenance Repair Practices”. Ricky also writes for different magazines during the past 20 years on technical, reliability and maintenance subjects. Ricky holds certification as Certified Plant Maintenance Manager from the Association of Facilities Engineering as well as a Certified Maintenance and Reliability Professional from the Society for Maintenance and Reliability Professionals. Ricky lives in Charleston, SC with his wife. Aside form spending time with his 3 children and 3 grandchildren, Ricky enjoys kayaking, fishing, hiking and archaeology. 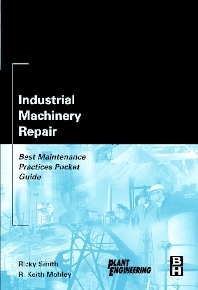 Great reference as well for any Maintenance Technician.